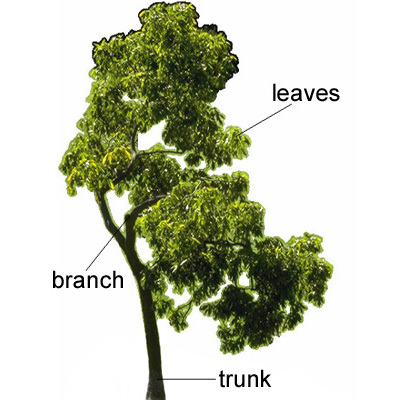 branchbranch1 /brɑːntʃ $ bræntʃ/ ●●● S2 W2 noun [countable] 1 of a treeHBP a part of a tree that grows out from the trunk (=main stem) and that has leaves, fruit, or smaller branches growing from it → limb After the storm, the ground was littered with twigs and branches. The topmost branches were full of birds.2 of a business/shop/company etcIN A LOCAL AREABB a local business, shop etc that is part of a larger business etc The bank has branches all over the country. a branch office in Boston She now works in our Denver branch. Where’s their nearest branch? They’re planning to open a branch in St. Louis next year. Have you met our branch manager, Mr. Carlson?3 of governmentOF AN ORGANIZATIONSSO a part of a government or other organization that deals with one particular part of its work → department All branches of government are having to cut costs.the executive/judicial/legislative branch (=the three main parts of the US government)4 of a subjectOF A SUBJECTAREA OF KNOWLEDGE, DUTIES, STUDY ETC one part of a large subject of study or knowledge → fielda branch of mathematics/physics/biology etc5 of a familyOF A FAMILYSSF a group of members of a family who all have the same ancestors → side the wealthy South American branch of the family6 of a river/road etcSMALLER PARTPART a smaller less important part of a river, road, or railway that leads away from the larger more important part of it The rail company may have to close the branch line to Uckfield.